With cafes in Wetherill Park, North Parramatta and Prestons, XS Espresso first came to fame thanks to social media — and thanks to the happily shared photos of its crazy shakes. Now owner Roky Gorgees is expanding his sweet treat empire once again, setting up shop on Hall Street in Bondi. Splashed with greenery and warmed by pendant lights, XS Espresso's newest location serves up all of the chain's favourites — and the shakes are as OTT as ever. Take the Golden Gaytime, for example. It's a caramel, coffee and vanilla shake that comes complete with a Golden Gaytime doughnut on top. Dishes follow suit. The Fluffy Nutter Double Waffles sandwich marshmallows between two waffles, then top the whole thing with crushed Malteasers, Oreos and Tim Tams. There's also the Dulche de Leche Pancake Stack, which comes with caramel dulche de leche, pretzels, torched banana, vanilla crumble and ice cream. Yep, whatever you order, you'll be getting big, rich flavours. 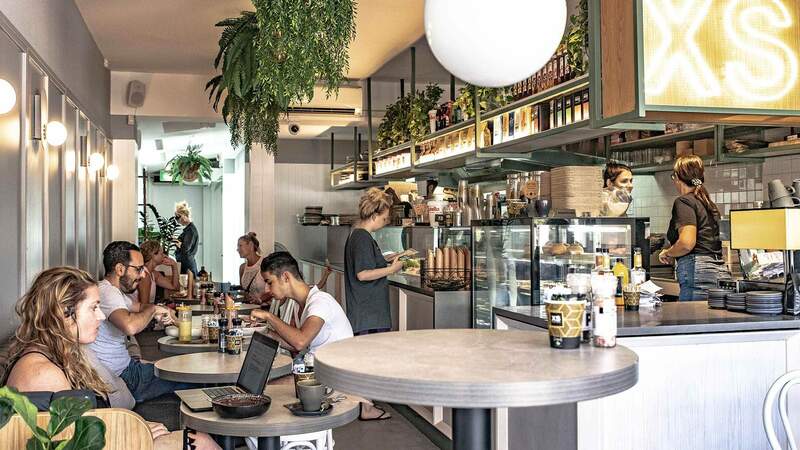 XS Espresso Bondi also slings an all-day breakfast and lunch menu, then serves up pizza and burgers for dinner until late. Campos coffee, protein shakes and fresh cold-pressed juice are also on offer, drinks-wise.